After last week’s more intense journaling for creativity game, this week's journaling game is a relaxed quickie, one you can play at any time. Huggle, derived from 'hug' and 'cuddle'. Brunch, from the union of 'breakfast' and 'lunch'. 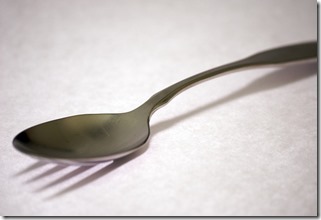 Spork, a blend of ‘spoon’ and ‘fork’. You can play this game at any time during the day, even when you are doing other tasks; just get into a habit of looking for a portmanteau as you go about your daily routine. Brusted, from broken and busted. Words created from portmanteaus are in common use and new ones are added all the time. There may be more in everyday use than you realise; if you would like to see more examples or just desire some inspiration for the game, there is a list of over 300, along with definitions, on Wikipedia at “List of portmanteaus” or click on the Wikipedia logo to the right. The game provides a straightforward method to simultaneously exercise your logical-mind and your creative-mind. The game, being language based, is predominantly a left-brain driven game. However, the constant need to discover associations between words and activities provides a focused demand on the creative-mind, which develops communication pathways between them. Forming portmanteaus can be a fun activity, especially when there is no immediate use for the results; the mind then has the freedom to wander and discover weird and wonderful combinations. Practicing the creation of portmanteaus also develops your ability to fashion them, making it easier if you ever need one for a story. Have a try now at forming a portmanteau and see what you come up with, then leave your best or favourite one in the comments area below. Photo credit: Spork, by Voiding Warranties. "Forming Portmanteaus to improve creativity" by Andy Shackcloth is licensed under a Creative Commons Attribution-ShareAlike 3.0 Unported License.